The Park & Sun Sports permanent outdoor tetherball set includes everything needed for a fun and competitive playing experience. Choose between the 2-piece pole set and the 3-piece pole set; with all other components exactly the same. The 2-piece pole set is designed with premium galvanized steel that measures 1-5/8" in diameter and stands 10' 3" in height. The 3-piece pole set is also designed with premium galvanized steel and measures 1-1/2" in diameter and stands 10' 6" in height. Galvanized steel not only provides exceptional stability, it's superior at withstanding harsh weather. The poles also resist rusting, so you can enjoy the game for years to come. 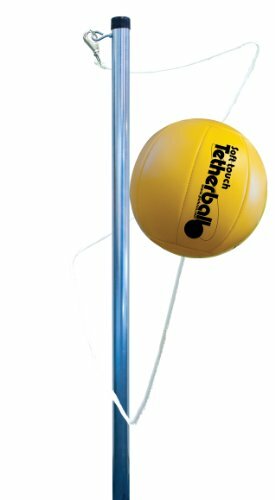 Each tetherball set includes a 12" in-ground pole sleeve, a heavy-duty nylon cord that measures 7' in length and 6 mm in diameter, and a compact hand pump with 2 inflation needles. 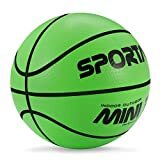 Also included is a regulation sized, machine-stitched Soft Touch tetherball that features a nylon-wound bladder, an inset valve stem and an internal steel swivel hook attachment which secures the ball to the cord. The soft and durable synthetic material of the padded tetherball cover lessens the impact to hands, wrists, and arms when hit.